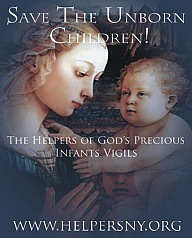 The Helpers of God’s Precious Infants are a group of people committed to maintaining a loving and prayerful presence outside of the abortion mills, where God’s children are put to death. We unite ourselves with these victims in solidarity with their pain, as they are put to death at this modern day Calvary. Just as Mary and John lovingly stood and prayed beneath Jesus’ Cross as he died, we wish to remain with these children in the hour that they were crucified. In Rockland County, the Helpers participate in prayer vigils at the Planned Parenthood site in Spring Valley. On Good Friday, they sponsor a special vigil at the site and on July 4, a mass and vigil at the Marian Shrine on Filor’s Lane in Stony Point. For more information, visit the Helpers’ website.